Well it has been a few days only since we saw Xperia A SO-04E Dogo NTT DoCoMo photos and specifications on FCC, now we have brought you Xperia A SO-04E User Manual Guide’13.5. Yes NTT DoCoMo has released a user manual guide for their to be launched phone Xperia A SO-04E. Only a few specifications of Xperia A SO-04E were featured lately like 5″ full 1080p HD screen, 13 MP rear camera, Android Jelly Bean, 16 GB internal memory, 2GB RAM, 2300 mAH removable battery and dimensions similar to Xperia Z. 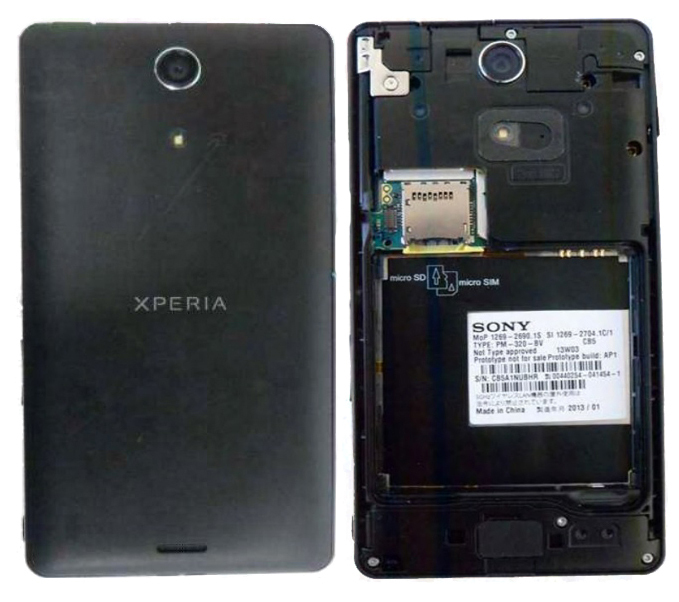 Nothing have been said about the processor and the chipset, yet we expect Snapdrgon 600 chipset in Xperia A SO-04E. 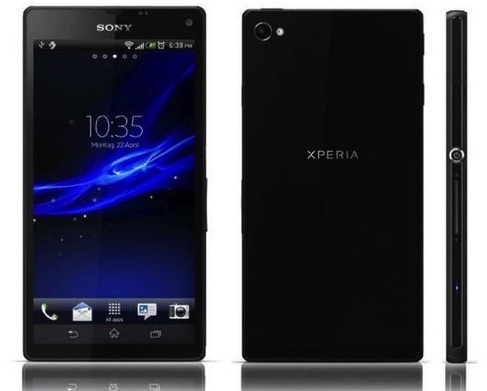 You can download the Xperia A SO-04E User Manual Guide Pdf from given below link. 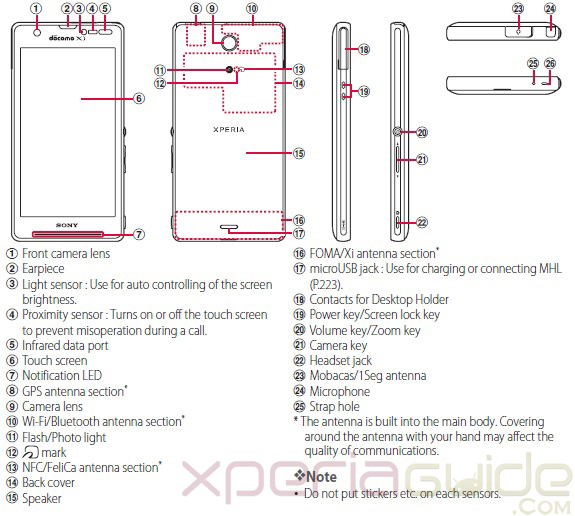 Check out in the below pic yourself, the various parts and their functions in Xperia A SO-04E. After looking in the Xperia A SO-04E User Manual Guide’13.5 we found the accessories which will be supplied with it like Desktop Holder SO15, 1Seg antenna cable SO01, microSD card 2GB already inserted in the terminal when bought, Stereo headset with microphone etc. Xperia A SO-04E User Manual Guide explains all the parts of the phone and functions and all those things which a normal manual guide tell, we don’t want to tell you that. 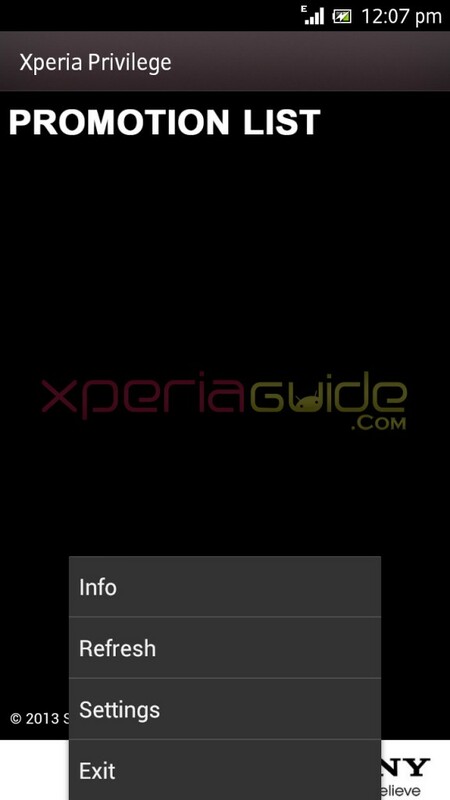 Download the Xperia A SO-04E User Manual Guide and explore the Xperia A specification and other details by yourself. Comments appreciated on views regarding the so leaked speicifcations of Xperia A SO-04E yet. As when Sony mentioned on their official blog that Xperia S, Xperia SL, Xperia Ion and Xperia Acro S will be getting Android 4.1.2 Jelly Bean update by the end of month May then it created a lot of disturbance among Xperia S and Xperia SL users which can be easily seen on various popular forums and other blogs, even you can notice the comments on the Sony’s official blog. 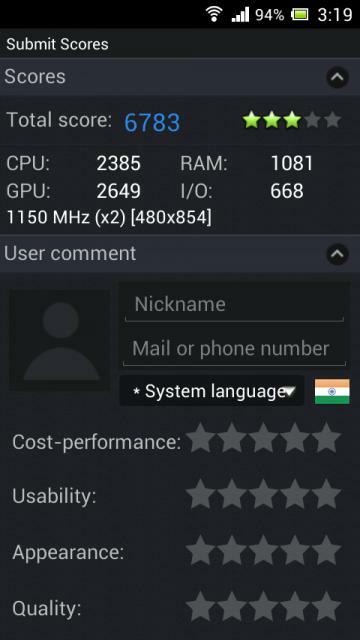 At present both Xperia S LT26i and Xperia SL LT26ii are on Android 4.0.4 ICS version. 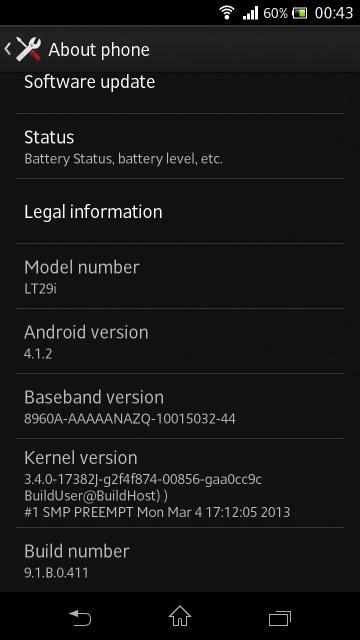 As stated officially Xperia S and Xperia SL users have to wait till the end of month May but the XDA Developer DooMLoRD has leaked the Xperia S/SL android 4.1.2 JellyBean firmware 6.2.B.0.197 with a porting method. 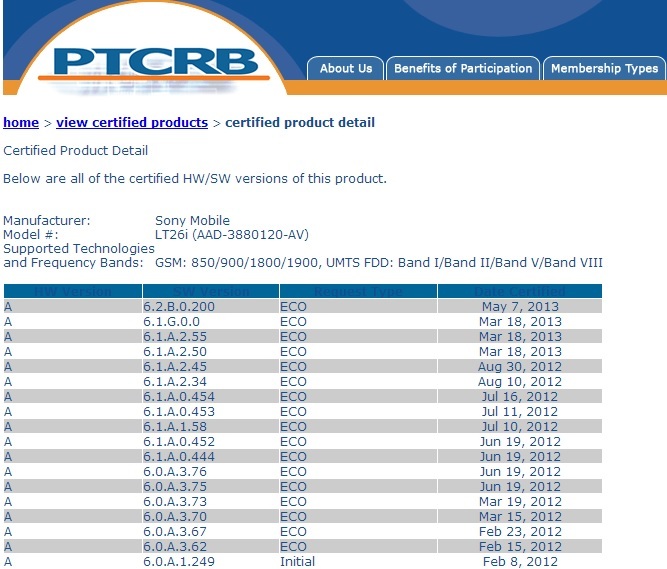 Leaked firmware 6.2.B.0.197 for Xperia S and SL are not the official release, mainly meant for developer (Brown) handsets but as when tested on consumer (Red) handsets, it is working smoothly with all features. While installing the firmware, if anything happens to your device then neither developer nor us are responsible, proceed further at your own risk. 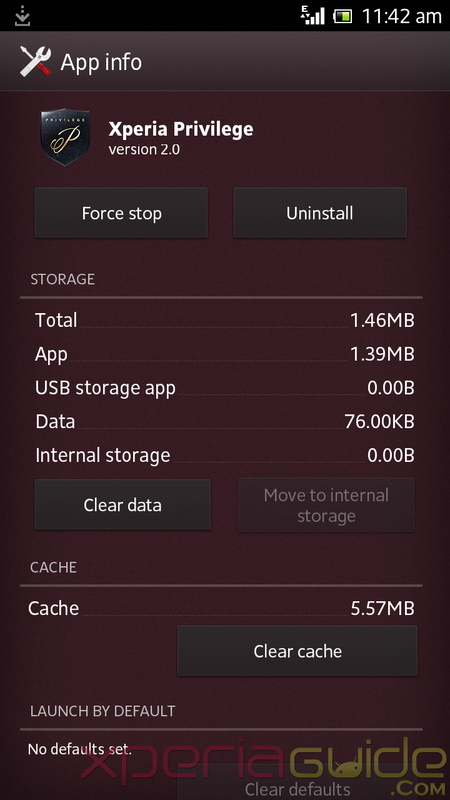 Before flashing the ROM it always advisable to back up content on your device. 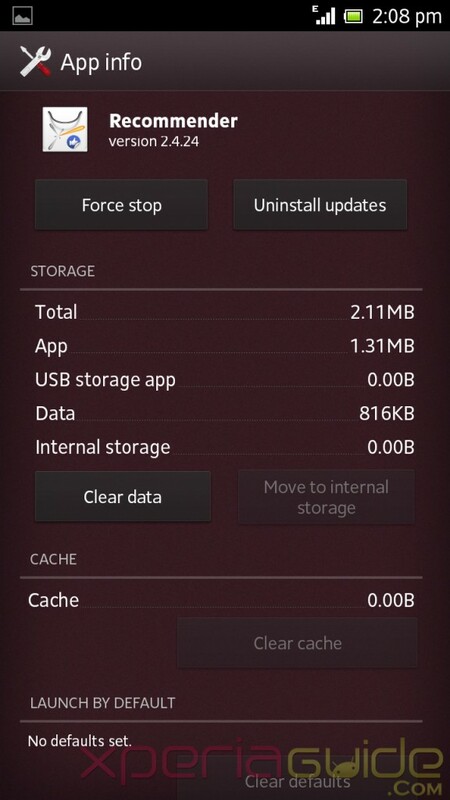 To take a back up on your Xperia S/SL, connect your phone to PC > run PC companion > Click on option “Back up and Restore” > Proceed with further options shown on screen. 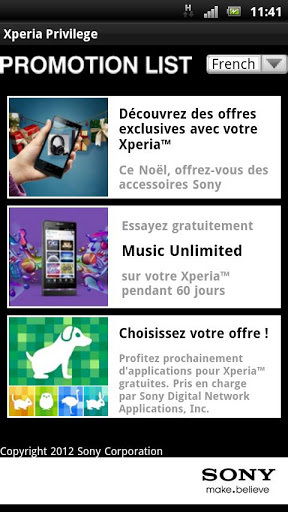 Bootloader on your Xperia S / SL must be unlocked. If it is not, do not proceed further. Your Xperia S / SL must be on Android 4.0.4 ICS firmware build number 6.1.A.2.55, if it is not then please update your phone. 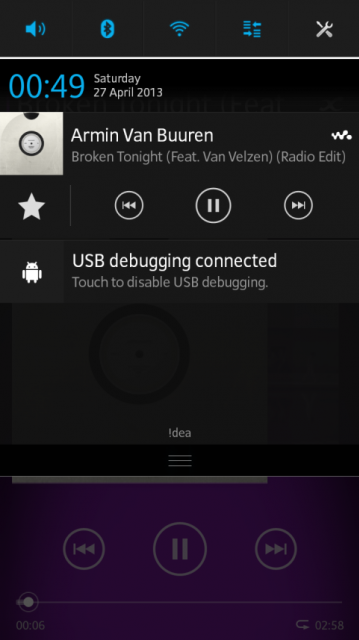 How to Install Android 4.1.2 Jelly Bean firmware 6.2.B.0.197 on Xperia S / SL ? After downloading the above ROM, save it on your phone’s SD Card. Check whether the /system partition is mounted or unmounted, make sure it remains unmounted. Now reboot your Xperia S / SL in recovery. Start flashing with ROMs update.zip file, time consuming task. Reboot your phone after the above step, as when phone boots and you see Xperia startup animation it reboots again, don’t worry. Reboot your device again, it may take a long time to do that, after updating ROM phone rebooting takes a bit time for the first time and after that is stabilize automatically. 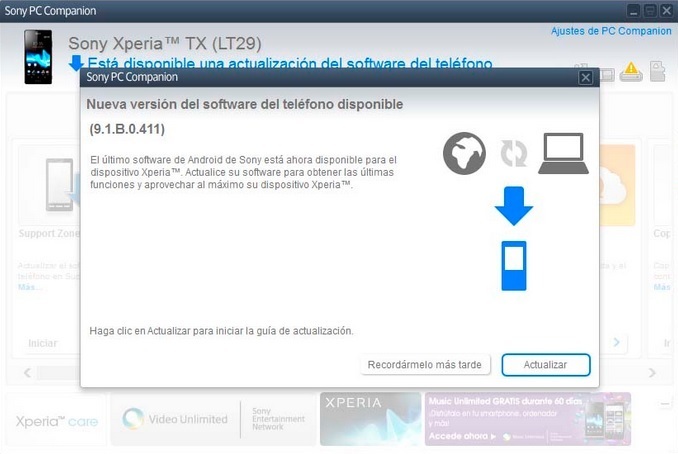 Now you are done installing leaked Xperia S/SL android 4.1.2 JellyBean firmware 6.2.B.0.197. Enjoy the jelly bean on your phone and its features. What to do if Status 7 Error comes ? As when you are flashing update.zip file via recovery, just extract boot.img which has pre-installed CWM recovery, from the ROM you pasted in your SD Card and then flash the file using fastboot then enter ROM and now flash it via recovery. New home screen added with 7 panes. White background new contact app / dialer. White background themed messaging app. New clock / weather widget added. New Media apps like Album, Movies, Walkman, Movies. 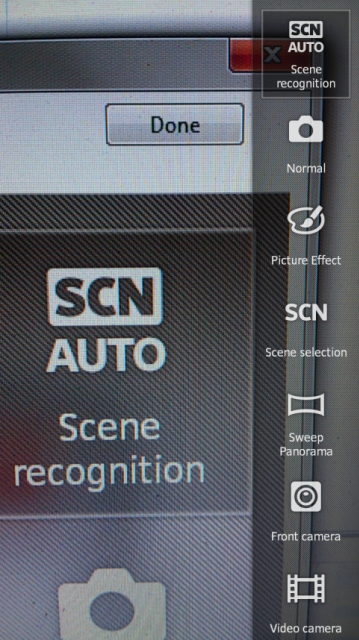 Improved camera performance and new features added in camera. 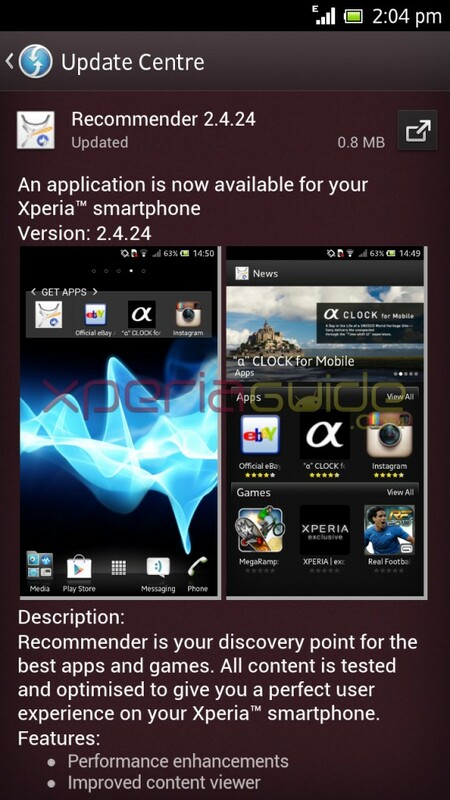 As this is only the leaked version of what Xperia S and Xperia SL are going to get in the official Android 4.1.2 Jelly Bean update but it may be the case the some features may be missing or updated as compared with this leaked ROM. 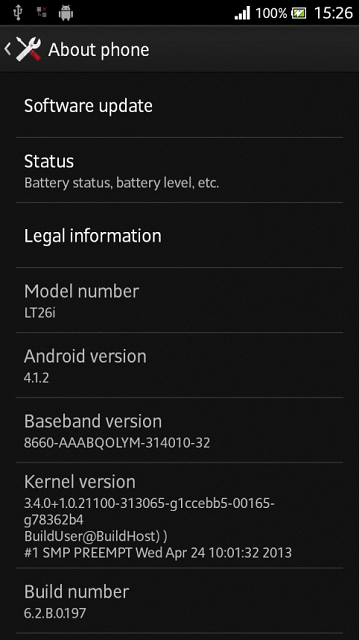 Do let us know if you have updated this leaked Xperia S/SL android 4.1.2 JellyBean firmware 6.2.B.0.197 on your phone. Do you like the Sony’s Jelly Bean flavor to Xperia S and Xperia SL. Well is has been only a few months since Sony launched it’s latest flagship device Xperia Z into the market globally, now alleged images of Sony C3 device powered with MediaTek Quadcore chip is leaked online. MediaTek chip will overall reduce the cost of the device and it surely will be a budget smartphone from Sony. Last we saw Sony releasing another set of budget smartphones like Xperia L and Xperia SP. 5 inch screen just like Xperia Z has it. Android Version 4.2 Jelly Bean. Front, back and the side look is similar to the Xperia Z. 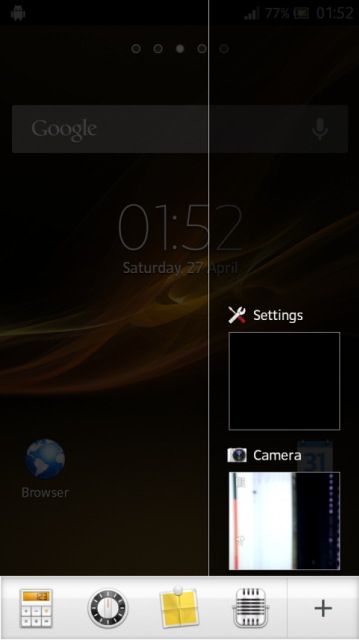 By just looking at the pic above of Sony C3, the screen wallpaper seems to be made by oneself looking very unrealistic. If rumors are to be believed Sony may launch the device in second half of 2013. After all its just an alleged leak on the net and it can be false also. Well it is rumored to come with Android 4.2 Jelly Bean, are you kidding; Sony has not updated yet Xperia Z to Android 4.2 and a new phone is leaked having Android 4.2. Expected price till now is speculated around 3000 Yuan. Well what do you think all regarding this alleged leak of Sony C3 on net, are you fascinated about it, let us know.